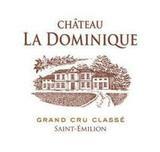 With its deep and shiny colour, Château La Dominique brings together the generosity of a Saint Emilion and the typicity of a Pomerol. The nose is intense, characterized by seducing aromas of ripe fruits and subtle spicy notes. In most vintages, you will find truffle and licorice notes, complemented by peppery and woody aromas. With a sharp attack, it is fleshy and round, with silky and precise tannins. The finish is long and full and leaves you with a pleasant feeling of bliss. Aimed to be aged in most vintages, but can also be appreciated during its early years. 89-91. Barrel sample. A very juicy wine made from grapes that were probably too ripe, this wine does have structure, but it shows only slowly through the soft, very juicy fruit flavors. Offers a lively spice box profile, with anise, cinnamon and clove notes studding the core of crushed plum and boysenberry fruit. A light savory shading runs through the caressing, open-knit finish. Best from 2016 through 2022. 7,500 cases made.